There is no more quintessential keto meal than eggs & bacon. I always do three cage-free eggs & 3 slices of uncured sugar-free bacon. 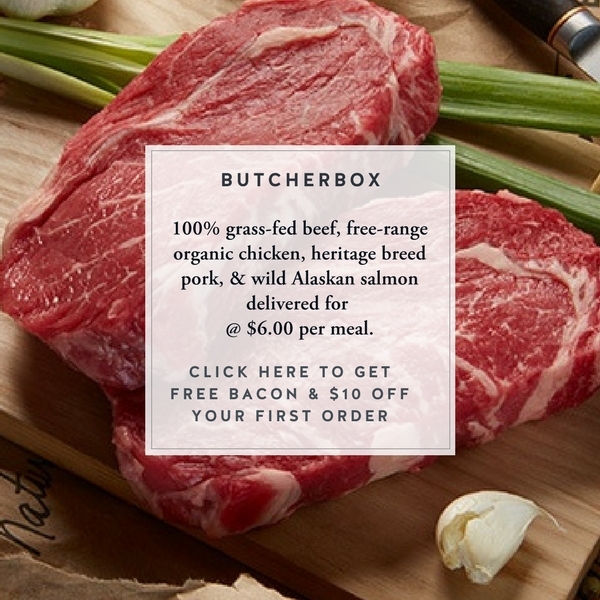 I get my bacon from Butcherbox. It tastes amazing and is sourced from small family farms in the U.S. that breed heritage breed pastured pigs. That's a break-the-fast meal that you can feel great about because it's quality & sustainably sourced food. I love eating bacon but I hate cleaning up the greasy mess if you cook the bacon in the pan because the grease goes everywhere. My solution was to cover the pan with a lid for the about half of the cooking time in order to cut down on the splattering. What I discovered was that covering the bacon allows the cooking liquid to accumulate, which bathes the bacon and preps it to dry out and become perfectly crispy after you uncover it and allow the liquid to evaporate off during the second half of cooking. So, that's the secret to crispy bacon – cover the pan for the first 3-5 minutes of cooking, then uncover and allow the liquid to evaporate. Other than that, I'm sure that you already know how to cook eggs and bacon your way. 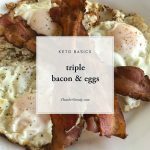 I list this meal here because it's a basic keto meal that I refer to over and over again when I'm tracking my macros in My Fitness Pal. Heat cast iron pan to medium heat on stove top. Add bacon to pan and cook until crispy & fat has rendered. For crispy bacon, cover the pan with a lid for the first 3-5 minutes of cooking, then remove cover and allow the liquid to evaporate while the bacon finishes cooking. Remove bacon from pan, and plate. Crack the eggs into the hot bacon grease in the same pan. For over medium eggs, cover the pan with a lid for 1-2 minutes, or until the whites have set and are browned at the edges, and the yolks have slightly firmed. Remove eggs from pan & serve with bacon immediately.